Along the seashore or in tall mountains or deep woods, New England has many beautiful walks and hikes that take you deep into nature’s beauty. See here the Top 10 country walks, where people of all fitness levels can explore and enjoy nature on a family vacation or getaway. Walking in New England countryside or towns or cities is a pleasure year-round, but we all know a very special time is when fall foliage lights up the place with brilliant colors. Merck Forest & Farmland Center is an environmental education organization on 3,160 acres of forest and farmland in the Taconic Mountains. Several trails offer walks ranging from short and easy to long and steep. Walks travel through woodlands, open meadows, farm plots; past streams; and up to mountain tops with magnificent views. Pure Vermont! Trails. Marginal Way in Ogunquit is a paved, public shoreline footpath. This jewel of a walk extends about a mile along a spectacular coast from Perkins Cove to Ogunquit Beach. The place to enjoy salty air and catch sweeping panoramic views of the Atlantic Ocean. Foot traffic only. Dogs allowed on leash from October 1 to March 31. The Marginal Way is an easy walk from the center of Ogunquit. 207-641-2200. Map. 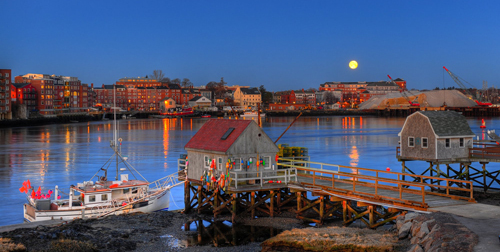 This walk through the small city of Portsmouth is a visual delight for people who cherish the architectural and seafaring heritage of New England. The Harbor Trail passes more than 70 points of scenic and historic significance in the very picturesque small city. 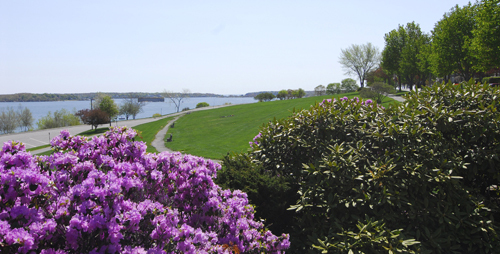 Walkers see a working port, colonial homes, lush gardens, Market Square, Prescott Park. Guided tours offered July 4 through Columbus Day. The magnificent Cape Cod National Seashore in Massachusetts stretches along the ocean side of Cape Cod and encompasses several beaches and towns. Within the national seashore are 40 miles of pristine sandy beach, marshes, ponds, woodlands, lighthouses, and cranberry bogs. The national seashore’s website has descriptions of several inland and shoreline walks. including Province Lands trails. Breadloaf Mountain in the Litchfield region is at the southern edge of Housatonic Meadows State Park. The mountain offers walks from moderate to strenuous; you can hike Breadloaf alone or jump off to other trails and loops. At the peak of Breadloaf is the Appalachian Trail; it is not hard for people who are new to hiking. More-rugged hikes are also accessible from the main trails. Best-known as a popular Christmas tree farm, the 1,400-acre Rock Estate is open to visitors year-round, offering structured and self-guided tours and programs. Originally a summer home, the Rocks Estate includes several buildings listed on the National Register of Historic Places along with a maintained trails system that includes short, easy strolls or longer hikes. 603-444-6228 Trail map.